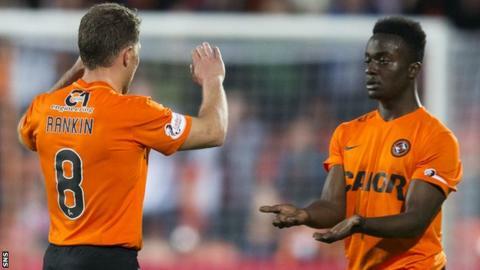 Dundee United caretaker manager Gordon Young admitted the goals his side lost in their 3-3 draw with Partick Thistle were "the story of the season". Relegated United came from 2-0 down to draw 3-3 at Tannadice. "The first goal's a corner - these are situations you practice, we give out roles and responsibilities and it's very unfortunate when you lose a goal because of that," said Young. "Every coach and manager will tell you that's really frustrating." Young said he challenged those leaving the club to "leave a lasting memory" for supporters in what will be their last match at Tannadice. The interim boss also praised young duo Mattie Smith and Justin Johnson for their contributions, the latter grabbing the stoppage-time leveller. "Mattie Smith's an explosive type of player, he's got the right character," Young told BBC Scotland. "When I came at first, he'd been injured and (former manager) Mixu (Paatelainen) and I liked how he went about his business. "Justin Johnson has got pace, which is so difficult to play against. He needs a bit of work - he'll be the first to admit that - but the idea to get a wide player the ball and let him take people on changes the dimension of the game. "By that point, you've abandoned your defensive responsibilities and we're asking him to be offensive and explosive and he was all of those things." Partick Thistle manager Alan Archibald said his side must eliminate slack periods from their play. "I just felt we should've seen the game out," he said. "These things matter. It's something we need to work on to move the club forward. We can't have these lapses. "We'd one two weeks ago against Inverness when we lost four goals with some similar defending." Looking ahead to next season, Archibald said the club's primary aim was to avoid relegation, adding that he only needs to add "two or three players" to his squad. "We missed out (on the top six) by a point and a goal this season," he said. "It's something we want to do. But we know first and foremost, we need to stay in the league. "We've seen other sides, big sides like Dundee United, slip out it. "We had a terrible start this year and I don't think we'll get away with that this year."